In a large bowl, mix everything together. The best way is to use your hands and really mix it all together. You can also use your stand mixer with the paddle attachment. There are a few different ways you can do this. I like to use a large cookie scoop / ice cream scoop. I lightly pack the meat into the scoop, release the scoop, then flatten it with my palm. Alternatively, you can just divide the meat into 12 rough balls, and shape each ball into a sausage patty. Lastly, you can also roll out the meat between parchment paper, then cut the sausages with a round cookie cutter / lip of a cup. Make 12 equal sized sausage patties. I make them about 1-inch thick if I am going to cook them straight away, but you can make according to your preference. If you are going to freeze half the batch, make the ones you are going to freeze no thicker than 1/2-inch, if you plan on cooking from frozen. Otherwise, you will need to defrost the sausage patties before cooking. Heat some oil in a non-stick skillet over medium-high heat. Add the patties (you might need to do it in batches) and cook the first side for about 3-4 minutes, or until browned. Flip then cook the other side until browned and the sausage is cooked through. The most reliable way to to check if a sausage patty is cooked through is to use an instant read thermometer. The internal temperature of each sausage patty should be 160°F / 71°C. If you are cooking from frozen, follow the same instructions, but you will need to slightly increase the cooking time. If the sausages are browned but not cooked through, turn the heat down and finish cooking. If you are going to freeze the sausage patties, the best way is to place each sausage patty on a parchment paper and freeze on a tray. You can stack the sausage patties into a freezer bag once the meat is slightly frozen (about 30 minutes). You can also stack the sausage patties with a sheet of parchment paper between them and freeze as a stack. But you run the risk that some of the sausage patties might stick together. If you are cooking them as a batch again, then it shouldn't be a problem because they will unstick after a few minutes out of the freezer. But if you plan on cooking only one sausage patty at a time, then it's best to lightly freeze on a tray before stacking the sausage patties. 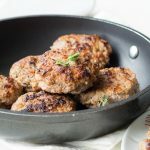 Get this recipe for Homemade Breakfast Sausage Patties at https://www.theworktop.com/breakfast-brunch-recipes/savory/homemade-breakfast-sausage-patties/.